Peach Patterns: Making my own clothes! Oh well, it's been bucketing down with rain here and before memories of Summer have completely vanished I should show you this dress I made during the warmer months. It's a teensy bit on-trend with the tribal print and pops of bright pink through the fabric (a cotton from Tessuti). I drafted the pattern (if you could call it that) myself - just a simple shift dress with shirring at the waist. I wasn't completely satisfied with the construction but the end result was OK and I've gotten a lot of wear out of it. If you've been hanging around the DIY boards on Pinterest at all, you'll be sure to have seen a few tutorials for polymer clay jewellery. Inspired by some of those, the girls and I had a go at making some beads during the summer holidays and this necklace was one of the results. It matches the dress quite nicely. We used FIMO brand clay, which was the one available at our local art and craft store. You need to "condition" the clay quite thoroughly with your hands to be able to mold shapes with it. It's a bit challenging for little kids who are used to using play dough but manageable enough. Other than that, it's really simple to use and quite addictive. I managed to sneak in a bit of sewing for myself before Christmas but haven't photographed or posted the results. This one is so simple and probably the least blog-worthy. But because it's easily been the most worn skirt of this summer, I'm giving it a little photo feature here. To make it I sewed a narrow tube of cotton knit fabric, inserted some elastic in a casing at the waist and hemmed it. To help the skirt keep its shape, I used a knit that's heavier than t-shirt weight. This is my first attempt at my Megan Nielsen Patterns "Darling Ranges Dress". In truth, this one was made as a muslin but because I made it in chambray (from Tessuti) it's actually perfectly wearable as is. I'm really impressed with how well the pattern worked with only very minor modifications. The issues I had were mainly with the darts. The bodice is quite fitted and, for me, the darts were way too radical, resulting in a very pointy bust apex (for those of you who remember, think Madonna circa 1990!) This was possibly not helped by the use of chambray. Another drapier fabric may have worked better. There is an extensive amount of information on Megan's blog about the construction and modification of this pattern posted during a sew-a-long earlier in the year. As luck would have it, Megan is currently running another sew-a-long on her blog for the equally fabulous Banksia Top. The first topics cover bust alterations so I'll try and apply the information to this pattern. It's such cute and easy to wear dress & I'm keen to make another. I recently made this top from the Lace (Ruffle) Tunic pattern from a back issue of "Stitch Magazine". I added the "ruffle" in my title in brackets because although that's the full name of the pattern my version was made without one. I also modified the pattern for winter by lengthening the sleeves. Hmmm, it looks a bit like I'm asleep standing up here, which is not the case! This pattern pushed me out of my comfort zone a bit because although it was simple, it involved 2 fabrics which I haven't worked with before and I was particularly nervous about working with the lace. Actually, it was pretty straightforward (with the exception perhaps of finishing the neckline edge, which was a bit fiddly to turn under and sew). Pattern: Lace Ruffle Tunic from the Spring 2010 issue of "Stitch Magazine". The instructions for making the tunic are in the magazine and the pattern template is available here through Quilting Daily. Size XS (there is plenty of ease in the pattern). Fabric: The main fabric is a lovely wool jersey in light grey and the yoke is stretch lace in charcoal, both from the Remnant Warehouse. Notions: Schmetz Stretch Needle in Size 11. When Colette announced the release of the Gabby Dress pattern I quickly got hold of a copy. Being from Tessuti, I figured, it would have to be good. I wasn't disappointed - I truly love this little dress. It's so simple to make and yet has a swingy, a-line shape that gives it heaps of style. The pattern calls for a drapey fabric. I wanted to wear the dress during winter and therefore chose this Liberty wool and cotton mix (also from Tessuti - got it during the 20% off sale - yaay!) which has a bit of warmth but is still perfectly lightweight and drapey. I feel a bit "mod squad" in the fabric: the colourway and design has a fabulously retro feel. I wore it for these pictures on one of the warmer days we've been having lately but dressed up with boots and a cardigan you're good to go in any weather. Pattern: Gabby Dress from Tessuti. Available in PDF format. Size: XS made with shorter hemline option (there is a longer option also). Notions: Tear away vilene (using this worked like a charm to stabilise the neckline for sewing and binding. It's easy to use and there's a tutorial here). One of the casualties of my self-imposed working bee over the past few months has been my blog reading schedule. Less blog reading equals less discovering of new links to fabulous things in the internet and crafty world. One bit of fabulous-ness I did manage to find (new to me, although maybe not to you) is the amazing work of Megan Nielsen. Megan is a young Aussie living in the US and has launched a pattern line based on a selection of favourites from her readymade designs. Because 2012 is suppposed to be "The Year" of making clothes for myself, I ordered a couple of Megan's patterns just over a week ago. As you can see they arrived super-quickly from the US. The packaging is divine and I love that the patterns have instruction booklets rather than the huge, awkward instruction sheets that tend to come with paper patterns. I'm getting stuck into the "Darling Ranges Dress" already (I"ve made a muslin of the bodice in some of the chambray you can see in the first shot) and can't wait to try the "Banksia Top" as well. 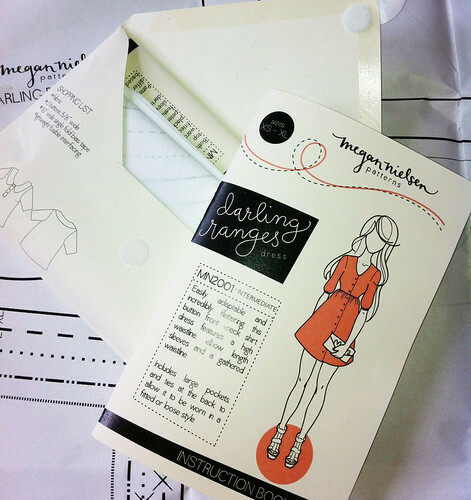 I didn't know at the time of ordering but was happy to find out via her blog that Megan is organising a "Darling Ranges" sew-a-long over March/April. We'll be away for some of the time but I'll finish and post mine when we get back later in April. Meanwhile, here is Megan's Pinterest page where you can see examples of Darling Ranges Dresses and lots of other inspiration. I made this top a little while back (in "summer"!) but haven't had a chance to post it. I was aiming for a basic loose-fitting tunic design with a (modified) bat-wing look. I didn't use a pattern but simply cut 2 rectangles of fabric and took it from there with some shaping for the shoulders and v-neckline. I added a drawstring belt by using a large bias maker to make the casing and a smaller one to make the drawstring. I knew that to get the effect I wanted I needed a silky, drapey fabric. Enter this fabulous rayon/cotton mix from Tessuti. It was exactly the right thing for the job. I don't think a heavier cotton would have worked as well. I posted a while ago about the patterns I was using to sew things for myself this summer. Here are some pictures of the Simplicity 2599 top and the ruffle skirt. As you can see, I made the top without the ruffles or neckline detail that come as an option with the pattern. I think the gorgeous Nani Iro gauze print speaks for itself and needs no further embellishment. The skirt is made in a Kaffe Fassett shot cotton. It's my own design and is based on the ruffle skirt for girls pattern. Instead of three tiers, it has an extended a-line piece with two ruffles at the hem. OK, now if only the weather gods would roll out the hot days so we can actually wear our summer clothes....?! My internet connection has been totally unreliable of late, hence the lack of blogging. I've been busy, though, drafting patterns and making clothes for both the girls and (get this!) myself. The Noodlehead sew-a-long got me all inspired to make myself some summer clothes and I've been busy making and perfecting muslins. Sewing adult clothes involves so much more of a time investment, I find, and can be ultimately disappointing as sometimes a pattern just doesn't work at all. This dress is in the Top 10 finalists of the Pattern Review Best Pattern of the Year poll. For me it was a total disappointment. The sleek and simple shift that the cover photo seems to promise was not what I got at all. The smallest size looked like a shapeless sack and pulling it in with a belt didn't seem to help at all. This is a classic and really popular pattern that you can see lots of finished examples of around the blogs and flickr. It's the perfect simple top which, once you've worked out your sizing, you can adapt in so many ways. I made a pared down version (no ruffles) in a lovely Nani Iro gauze which I'll post some pics of asap. In the same way that the Simplicity 2599 is the perfect basic top pattern, this one is the perfect A-line skirt pattern. I needed a new denim skirt to knock about in and this worked really well for me. This one is on my "to do" list: not sure whether I'll get around to it pre-Christmas (though I think it would make a great Christmas day dress). I chose this because I saw the gorgeous dress Kate made to this pattern a little while back. I've also made myself a grown-up version of my Raw Edge Ruffle Skirt for girls. I adapted the pattern so that it has a longer A-line piece from waist to knee with 2 smaller ruffles at the hem. An easy-peasy summer skirt. By the way, I've found the sheer solid coloured fabric from Spotlight called "Bahama voile" and "cotton lawn" to be great inexpensive options for doing test runs of patterns. Those and, of course, the indispensible "Easy Trace" which is so much better than paper for tracing off patterns.